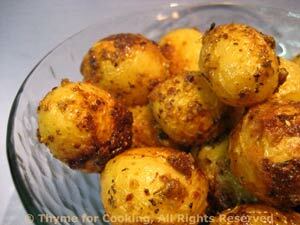 Roasted Potatoes with Dijon Mustard, Thyme for Cooking gourmet side dish. New potatoes are another spring delicacy. They are very tiny, usually covered in dirt and only keep a few days. If you can't find them at a farmer's market, use small fingerlings. If potatoes are golf ball size or larger, cut in half. If smaller leave whole. Put mustard, olive oil, garlic and herbes in a medium bowl, and whisk well; it will be very thick. Add potatoes and stir well to coat. Put them on a baking sheet with a lip (trusty round pizza pan) and bake in the oven for 35 minutes. Remove and serve. These stay very creamy inside.